We had a excellent experience and it turned out a highlight of our trip. Gorgeous cruiser , very attentive staff and delicious lunch! We only shared with one American family so gave us privacy. It really worth joining this tour! It was our last day of our visit to Greece and what a perfect farewell. The sail was perfect with a wonderful crew and great food!! These guys should open a restaurant!! We made a few stops for swimming and taking in the sites. The crew anticipated our every need. A great trip!! A very pleasant cruise with plenty of time for swimming. The crew was very polite, personable and attentive and the food was outstanding. A wonderful way to spend the day...highly recommend. Such a great break from the heat and crowds of Athens. My family booked a sunset cruise and it was our favorite activity while visiting.... Beautiful boat, friendly and professional crew, AMAZING dinner! Water was clear and warm enough to swim. Highly recommend! 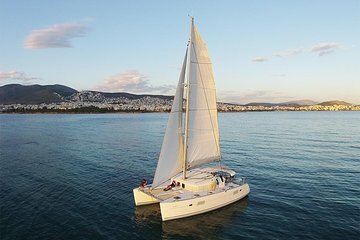 If in Athens, I highly recommend this cruise for a relaxing outing. The booking was simple and the entire process was great. We were picked up on time and were treated very well from the start. The crew is constantly checking on everyone and the food was magnificent. While the water was a little cold, we still had a great time swimming and snorkeling. The sad part was that it had to come to an end. We were then transported back to our apartment. Boat was more than expected, crew was wonderful, one of the best meals of our trip! Don’t miss this one!! Amazing!!! Our best tour during our vacation in Athens. Our meal was so delicious and fresh and we loved swimming in the Aegean Sea. Also loved the unlimited wine. The views were amazing as well as the sunset. Highly recommend!!!! I cannot say how great this was. Everything was fantastic. The skipper and first mate were friendly, fun and accommodating. The boat was great and the meal was absolutely outstanding. This trip is worth it and was one of my favorite things we did on our 10 day trip.